BROWN (US) — Looking at soybean crops in Brazil, Argentina, and Iowa reveals that soils have taken on a new role: mediating the environmental consequences of modern farming. Just 20 years ago, the soils of the Amazon basin were thought unsuitable for large-scale agriculture, but then industrial agriculture—and the ability to fertilize on a massive scale—came to the Amazon. What were once the poorest soils in the world now produce crops at a rate that rivals that of global breadbaskets. Brazil’s soybean yields have become competitive with those of the United States and Argentina, but the soil demands a lot of phosphorus, which is not renewable. In the US, meanwhile, historical applications of the fertilizer have polluted waterways. The study focuses on the relationship between soils and phosphorus, a key agricultural nutrient. Typically in short supply, particularly in tropical soils, phosphorus is unique among fertilizer requirements. It is finite, irreplaceable, and mined in just a few places around the world. “If that suggests scarcity, which is a concern, the overuse of phosphorus can also pose another problem, causing harmful algal blooms in waterways,” says study co-author Stephen Porder, assistant professor of biology at Brown University. The new study, published in the January edition of BioScience, compares the production of a single crop, soybeans, in the three places they are grown most—Iowa in the US, Mato Grosso in Brazil, and Buenos Aires in Argentina. What the authors found was an example that illustrates how the combination of management and soil type frames the phosphorus-related concerns associated with these massive agricultural enterprises. “Here are three regions where the crop that comes off the farm field is the same, but the fertilizer that goes in and the effects of this fertilizer on the environment are very different,” says lead author Shelby Riskin of Brown University and the Marine Biological Laboratory. “Having a one-size-fits-all approach to our understanding of interaction between people and their environment via agriculture is going to lead us to some erroneous concerns and conclusions if we don’t take the regional biophysical setting into account,” Porder says. The Oxisol and Ultisol soils in the soybean fields of Brazil’s Mato Grosso state, which were once rain forest land, absorb phosphorus and don’t easily let go. Successful soybean cultivation there since the 1990s has only been possible with improved soybean varieties, and large inputs of lime (to raise the soil pH) and phosphorus (to overcome the soils native deficiency). 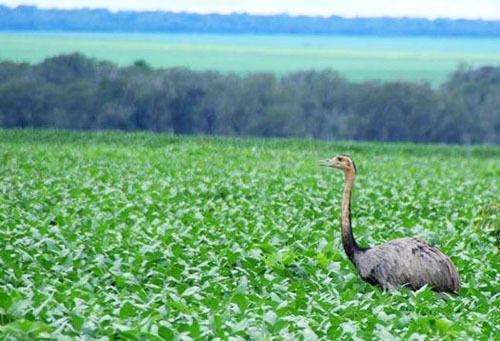 These large inputs mean the soils in Mato Grosso are gaining about 31 kg phosphorus per hectare per year, according to the researchers’ measurements. If there is a best of both worlds, according to Riskin and Porder, it seems to be in the Buenos Aires province of Argentina, which has soils similar to Iowa’s. There farmers who started growing soybeans much more recently than their Iowan counterparts have been able to achieve similar yields without applying much phosphorus. Until 2000, the researchers found, soybeans were drawing more phosphorus out of the soil than farmers were adding, leading to net deficits of phosphorus without much pollution. More recently, the Argentines have been adding more of the fertilizer, leading to a roughly break-even phosphorus budget. By 2050, Porder says, the world’s farmers will need to need to grow about 70 percent more food. With limited supplies both of phosphorus and clean water, farmers must balance adding enough phosphorus to maximize yields but little enough to avoid unintended losses. Learning the lessons of Brazil and Iowa, Porder says, may allow new farmers in places where productivity is not yet but could be great to avoid polluting water and exhausting the world’s phosphorus supply. “With increasing global demands from a growing population and growing appetites for commodities like meat, we will need to produce much more from cropland over the coming decades,” says Riskin. The paper’s other authors are Christopher Neill of the Marine Biological Laboratory, Meagan Schipanski of Pennsylvania State University, and Elena Bennett of McGill University. Funding from the National Science Foundation and the Andrew Mellon Foundation and collaboration with the Instituto de Pesquisa Ambiental da Amazonia supported the research.